In a pan bring salted water to the boil. Add the pasta and cook until al dente. In the meantime gently heat a separate pan adding olive oil an butter and allow it to melt. 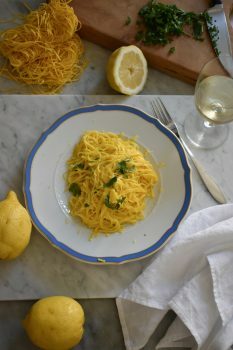 Add grated lemon zest and just after that the lemon juice. Once the pasta is ready reserve on the side a small cup of the cooking water (water from cooking the pasta). Drain the pasta and add it to the pan with the lemon juice. Stir well while keeping the pan on a gentle heat. Taste and add more lemon juice or butter for the creamy consistency of your liking. If the sauce is too thick add a couple of teaspoons of the reserved water and stir very well. Once you are happy with the taste and consistency add the garnish of your choice and serve immediately.